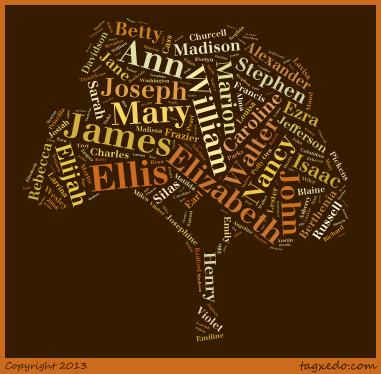 My Ellis family line starts with Rosa Evelyn, my 2nd great-grandmother. She was born 28 March 1853 in Murray County, Georgia, where she lived almost her whole life. She married Martin LaFayette Roberts on 27 January 1872, in Murray County. They had eight children in 18 years. She died on 25 March 1936, in Murray County, at the age of 82 and is buried at Spring Place Cemetery. Rosa Evelyn Ellis’ father was Elijah Marion Ellis. He was born on 13 November 1825, in Buncombe County, North Carolina. He married Elizabeth McKinney Tucker on 21 March 1852, in Murray County, Georgia. They had four children during their marriage. He died on 26 June 1863, in Murray County at the age of 37, and is buried at New Prospect Church Cemetery. James Churcell Ellis was born in July 1855 in Murray County, Georgia and died 8 April 1930 in Baker County, Georgia. Elijah M. Ellis was born 27 December 1859, in Spring Place, Georgia and died 11 January 1949 in Camilla, Mitchell, Georgia. Nancy Elizabeth Ellis was born 18 August 1862 in Georgia and died 2 March 1941, Rodentown, Baldwin, Alabama. Elijah Marion Ellis’ father was James E. Ellis who was born in 1791. He married Nancy McClure on 23 May 1812 in Haywood County, North Carolina. They had 12 children in 23 years. He died in July 1849 in Gilmer County, Georgia, at the age of 58. Elijah’s father, Walter Ellis, was born in 1750 in North Carolina. He married Mary Parker on 8 May 1776. They had eight children in 22 years. He died on 13 November 1821 in Jackson County, Georgia at the age of 71. Walter was a soldier during the American Revolutionary War, serving in Lillington’s Brigade and later Butler’s Brigade. Ellis is derived from the Greek “Elias,” which comes from the Hebrew “Eliyahu”, and means “Jehovah is God.” It became popular in the Middle Ages as soldiers and pilgrims returning from the crusades bestowed the name on their children. If you have any additional information (or corrections) on the Ellis family, comments are most appreciated! the headstone in Spring Place cemetery offers a different date of death. Hi Faye, yes I’m aware of that. I’m using the date from her death certificate.